As a self-described "Trekker" since "Star Trek: The Original Series" first warped into syndication, the prospect of this movie inspired in me feelings of both keen anticipation and dread. For years, many of us Trek fans have wanted a movie about the Starfleet Academy days of the original crew, but we wanted it to be true to the spirit of "Star Trek" while adhering to established canon. Nowadays, however, such sentiments are likely to cause you to be labeled a "diehard Trek supergeek" and berated for being such a dour spoilsport nitpicking over details instead of sitting back and letting this flashy new thing carry you off on a wave of giddy delirium. Well, I don't mind being called a geek, but when other geeks call me a geek, then they need to shut up. In other words, you really can't point out the mote of dust in someone else's eye if you have an action figure stuck in yours. Anyway, I went to see director J.J. Abrams' big, new, glittering, pulsating, eye-popping STAR TREK movie today, and I must say first of all that it is a grandly entertaining cherry-red fire engine of a space flick. Watching it is like getting up on Christmas morning and finding out that Santa Claus really went all out on your house because you were extra good that year. There's an endless parade of stunningly imaginative set design, amazing special effects, and some action setpieces that made me glad sci-fi movies were invented. The new USS Enterprise looks great on the outside, and the bright, snazzy interiors felt like home after I had some time to settle into them. Best of all, there was actually a story buzzing around amidst all these cool state-of-the-art visuals. It involves an enormous Romulan warship that has elements of both (a scaled down) V'ger from STAR TREK: THE MOTION PICTURE and the Romulan warship "The Scimitar" from STAR TREK: NEMESIS, and a vengeful Romulan commander named Nero (Eric Bana) who is reminiscent of the vengeful Khan from STAR TREK: THE WRATH OF KHAN and the vengeful Romulan commander Shinzon from STAR TREK: NEMESIS. (An aside: the widely-reviled NEMESIS is one of my favorite Trek movies. Shows you what I know.) So basically, Nero is really pissed-off, he hates Earth, he hates Vulcan, he has a practically invincible starship that can travel through time and destroy worlds, and he's coming to get us. Check. Meanwhile, we get to see young Kirk and Spock in their formative years, with Kirk a rebellious orphan born in battle and raised in Iowa, and Spock the half-Vulcan, half-human misfit who's unsure which path to take in life and must suffer discriminatory taunts from his full-Vulcan peers. Spock chooses to enter Starfleet (partly to spite the smug Vulcan tight-asses who patronizingly deem him fit to attend the Vulcan Science Academy despite his "inadequacies") while Kirk stumbles into it like a bull in a china closet. We see Kirk cheating his way through that fabled Kobiyashi Maru test, meeting Spock under less-than-friendly circumstances, hitting on Uhura, and being whisked into a frantic mission to rescue the planet Vulcan from oblivion even though he's been suspended from duty, thanks to an obliging Dr. Leonard "Bones" McCoy. Once aboard the Enterprise, of course, it isn't long before the young hot-shot proves himself Alpha Male #1 and is sitting in the captain's chair. But first, he must get forcibly ejected from the Enterprise in an escape pod, meet both Scotty and the original Leonard Nimoy version of Spock on an ice planet, get beamed back aboard the Enterprise during warp, and fight to the near-death against Spock to prove the emotion-prone Vulcan unfit for command. Just how much of this sticks to that pesky "Star Trek" canon that us diehard supergeeks are so nitpicky about becomes irrelevent as soon as the time travel factor enters the equation. Nimoy's "Spock Prime" is there to remind us that whatever happened between the moment the TV series first became a gleam in Gene Roddenberry's eye to the last time Patrick Stewart said "Make it so" is now part of a different timeline that has gone on its merry way into history. Thanks to the Romulan villain Nero and his temporal meddling, we now have a Star Trek universe in which most of the old characters are still there but in which anything can happen. This rules out what many of us have wished for over the years--a retro-Trek origin story that accurately sets up the later adventures with a steadfast adherence to continuity--but maybe by this point it's not such a bad approach to take. I certainly don't like the idea of ignoring the old fans who have been loyal to Star Trek for all these decades and courting new ones who don't care about its history. Indeed, if it weren't for us the show would've died back in the late 60s and we wouldn't even be discussing it as a big-budget summer blockbuster here in the 21st century. But after seeing this modern reboot, and being, frankly, dazzled by it, I must say that J.J. Abrams and company seem to have had the old fans well in mind every step of the way. There's an awful lot about this movie that can only be appreciated by viewers who are already familiar with the characters and their history. And seeing all the little details fall into place, even if the fit is a good deal different this time around, is a satisfying experience. As a film, STAR TREK is killer entertainment that starts out with a bang and doesn't let up. The pre-titles sequence is awesome, with the USS Kelvin under the command of Captain George Kirk going up against Nero's ship in a hopelessly one-sided battle while his wife is in sickbay giving birth to their son James. Later, there's a thrilling parachute freefall involving Kirk and Sulu over the planet Vulcan which leads to aerial hand-to-hand combat atop a drilling platform suspended miles in the air. (In one of several nods to the original series, Sulu even gets to display his fencing prowess here.) The space battles which occur throughout the film are intense, action-packed, and beautifully rendered. And as in Spock's demise in WRATH OF KHAN and the destruction of the Enterprise in THE SEARCH FOR SPOCK, there are a couple of major death scenes here that are stunning and totally unexpected. Perhaps the most important element in this film's success or failure is in the casting. Chris Pine captures the brash arrogance and boyish likability of James T. Kirk without doing a full-on Shatner impression, while Zachary Quinto seems to have been born to play the young Spock. Other actors--Zoe Saldana as Uhura, John Cho as Sulu, and Simon Pegg as Scotty--convey the essence of their characters while bearing little resemblance to their predecessors. As Pavel Chekov, Anton Yelchin manages to actually make me like the character for the first time ever, giving the proceedings a hefty dose of highly-effective comedy relief. Ben Cross and Winona Ryder aren't great as Spock's parents, but they're pretty good, and Bruce Greenwood makes a fine Captain Christopher Pike. Best of all, however, is Karl Urban as Leonard McCoy. He inhabits the role as though somehow possessed by the late DeForest Kelley, and it's a real pleasure to watch him forming an instant kinship with Kirk, developing his adversarial relationship with Spock, and saying things like "Dammit, I'm a doctor, not a physicist!" for the first time. Somehow, though, I didn't find the film all that cathartic at the end. Maybe repeated viewings will change this, I don't know. It just didn't seem to do that "climax" and "denouement" thing as successfully as an adventure of this magnitude should, leaving me somewhat less than ecstatic after the fadeout. 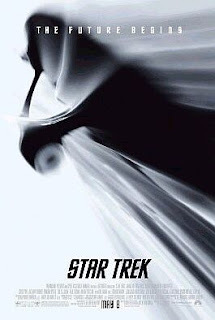 It could be that this hyperkinetic, visually intoxicating thrill ride lacked the kind of deep, emotional resonance that previous "Star Trek" movies have always had to one degree or another. Maybe these revamped characters and this rebooted universe are so new and unfamiliar that they aren't yet capable of making us feel the old magic. Maybe the emphasis on flash and sensation gives the whole enterprise a slightly superficial quality. Or, most likely, maybe we'll just have to wear this new pair of shoes for awhile before they start to feel as comfortable as the old ones. Its a film which you can take anyone who enjoys sci-fi to, not just someone who knows the last 40+ years of Trek.The movie itself was brilliantly cast and performed with each actor being enough like the original to be believable in the role .